F/i - "A Question For The Somnambulist"
Originally released in 2003 on Hadley Kahn's Submergence label, F/i's A Question For The Somnambulist has been reissued by Strange Attractors as part of their Resurrection series in a limited edition of 1000, with different artwork and a BONUS track. With the exception of the bonus track my description of the album is more or less word for word from the original review published in AI #24. But in honor of this much welcome reissue it made sense to revisit the album. 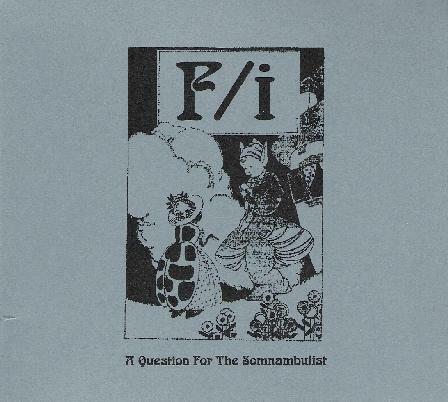 At the time, A Question For The Somnambulist was the first full length from F/i since 1997's Helioscopium. Brian Wensing and Grant Richter on guitar and electronics had returned, joined by Darwin Grosse on drums and electronics, and Richard Franecki, returning to the fold after having left some years before to form Vocokesh. There are nine tracks on the CD. The set opens with "Uber-Wizards Of The 88th Meridian", a 14 minute slab of what F/i do best... lengthy rocking space jams. It's a treat having the dual guitars of Wensing and Franecki back, creating a molten metallic sludge core that destroys everything in its path. Things get mightily intense about halfway through when the band is in full swing and the chords are blasting, the solos ripping and the space electronics soaring. "Hit The Kill Switch, Eugene" is a cool tune with pounding "Shouldn't Do That" styled metal chords, winding and wailing trip guitars and swirling alien efx. "Keep The Third Eye Open", "No Pepsi In Kabul" and "Prelude To The Afternoon Of A Daisy Cutter" are all valium paced tunes with the trademark F/i jam and electronics forming the foundation and spiraling space efx adding color and intensity, while the guitars continue their slow creeping jam. But the music on "Keep The Third Eye Open" is given a psychedelic edge with the addition of a raga sitar sound, though it later mutates into a searing noise-drone. "No Pepsi In Kabul" features more ragas and sitar but has a more overt Indian flavor. "Surgical Procedures On The Ship" is a haunting prog-space keyboard and electronics dominated piece that would be perfect for a sci fi film. Similar proggy keyboards can be heard on the ultra spaced out "Using Enemy Weapons". The title track is a nearly 16 minute workout that recalls the glory days of Space Ritual era Hawkwind and spacey Krautrock á la early Amon Düül II and Tangerine Dream. The music is highly atmospheric with a focus on ambience, effects and general freakiness. And we've also got the bonus track, "The Hot Shop", which is a total rocking deep space number that will get your toes a tappin' and yer hips a shakin', with ripping guitars and a carnival of space electronics. Oh yeah…. In summary, old space rockers never die... they just decide to leave Earth for good and go permanently into space. Nuff said... buy this album. Visit the Strange Attractors Audio House label at: http://www.strange-attractors.com.